The ACLU has called attention to a recent video showing a Barstow, California police officer throwing an eight month pregnant woman to the ground. They are calling the assault ‘horrifying’ and demanding that action be taken against the officer. Police were called to the scene after two women got into an argument over a parking spot at an elementary school. 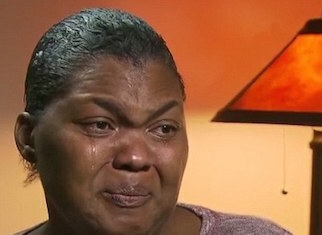 Charlena Cooks, a black woman, got into an argument with a white female employee of the school. The responding officer immediately singles Charlena out and begins to escalate the situation, leading some to question the racial motives of the officer. His escalation eventually leads to the officer roughly handling the woman, cuffing her and slamming her to the ground. Cooks makes a phone call, and while she does, she tells the officer her name is Michelle. Cooks often goes by her middle name, she said. But the argument between the officer and Cooks escalates. The officer grabs Cooks, and a second officer joins him. Cooks begins to shout and scream. The two officers pin her against a chain-link fence, and the pregnant Cooks lands on the ground, on her stomach. The officers handcuff her as she faces the ground. The officers struggle to lift Cooks from the ground. Officer: “OK, you’re under arrest,” and the officer walks her while she is handcuffed to the squad car. Cooks weeps, telling police she doesn’t want to get into the squad car. Cooks was then arrested for resisting arrest, that most recursive script of legal malarkey. The charge was later dismissed by the judge, not just because of the abuse she received, but because it was an unlawful arrest to begin with. The Barstow Police Department says that they have initiated an internal investigation of the incident, while assuring the public that the arrest and assault were not racially motivated. Cooks has not brought any charges against the department and the ACLU claims it is not defending her in a civil case, only illustrating the kind of abuses that often go overlooked. “He automatically assumed I was guilty. I’m really scared. I’m trying to move out of Barstow now, like tomorrow.” Cooks said. “I was in unbelievable pain. I felt they killed my baby already. Of course, police officials are still justifying the officers actions and the illegal arrest. Go figure.